Good morning! I'm playing along with Sparkle's Christmas Card Challenge Week #49, and I used Jen's latest Sketch For You To Try (11/7/09) for my Blessed Christmas card. I absolutely loved this sketch! The circle was perfect for the beautiful wreath from Verve's O Christmas Tree. I stamped, colored and cut out the bow and the poinsettias and popped them on top of the wreath for dimension. I was inspired by Amy's take on the sketch here and how she added her sentiment on the top and bottom narrow panels, so I did the same with a sentiment from Blessed Christmas. The wreath and the sentiment panels are popped up with foam tape. I added some stitching, then I finished off the middle of each poinsettia with a pearl. Since I didn't have any scarlett pearls, I used white ones and colored them with my R89 Copic sketch marker. Have a great week! Thanks so much for stopping by! Accessories: Circle and Labels Eight Nestabilities (Spellbinders), Markers (Copic), Pearls (Kaisercraft), Foam tape, Thread, Sewing machine. So pretty! I will have to try the pearl/copic thing! 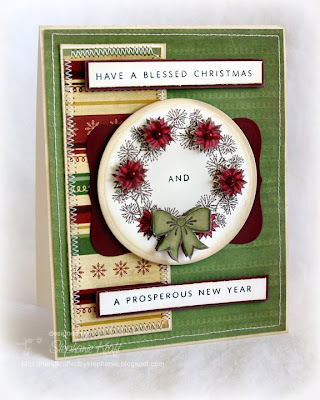 Beautiful papers and colors, totally LOVE the wreath, and you did a FANTASTIC job with the sketch!! Awesome!